I woke up on Tuesday, 17 Nov 2009 completely unaware of what was about to unfold. I tried to log in to RealClimate, but for some reason my login did not work. Neither did the admin login. I logged in to the back-end via ssh, only to be inexplicably logged out again. I did it again. No dice. I then called the hosting company and told them to take us offline until I could see what was going on. When I did get control back from the hacker (and hacker it was), there was a large uploaded file on our server, and a draft post ready to go announcing the theft of the CRU emails. And so it began. From that Friday, and for about 3 weeks afterward, we were drafted into the biggest context setting exercise we’d ever been involved in. What was the story with Soon and Baliunas? What is the difference between tree ring density and tree ring width? What papers were being discussed in email X? What was Trenberth talking about? Or Wigley? Or Briffa or Jones? Who were any of this people anyway? The very specificity of the emails meant that it was hard for the broader scientific community to add informed comment, and so the burden on the people directly involved was high. I think we did pretty well considering – no other site, nor set of scientists (not even at UEA) provided so much of the background to counter the inevitable misinterpretations that starting immediately spreading. While some commentators were predicting resignations, retractions and criminal charges, we noted that there had not been any scientific misconduct, and predicted that this is what the inquiries would find and that the science would not be affected. (Note, the most thorough inquiry, and one that will have to withstand judicial review, is the one by EPA which, strangely enough, has barely been discussed in the blogosphere). Overall, reactions have seemed to follow predictable lines. The Yale Forum has some interesting discussions from scientists, and there are a couple of good overviews available. Inevitably perhaps, the emails have been used to support and reinforce all sorts of existing narratives – right across the spectrum (from ‘GW hoaxers’ to Mike Hulme to UCS to open source advocates). Things have clearly calmed down over the last year (despite a bit of a media meltdown in February), but as we predicted, no inquiries found anyone guilty of misconduct, no science was changed and no papers retracted. In the meantime we’ve had one of the hottest years on record, scientists continue to do science, and politicians…. well, they continue to do what politicians do. A little behind schedule, I finally found time to read the article in the July 2010 edition of Physics Today “Touring the atmosphere aboard the A-Train” by Tristan S. L’Ecuyer and Jonathan H. Jiang. I think this article is a worth-while read, telling a fascinating story about how new satellite missions lead to greater understanding of our climate system. Yesterday, the New York Times ran an excellent cover story on sea level rise, together with two full pages inside the paper, fancy graphs and great photographs (online version here). 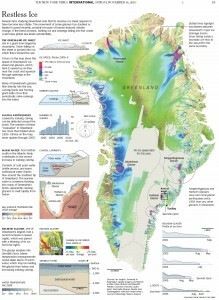 The author, Justin Gillis, researched the piece for months, visited Greenland and talked to most of the leading scientists in the field – many of which he cites in the article. The science presented is correct and up-to-date and the story is a gripping read. That’s how science journalism should be! What is going on in Greenland? (c) The New York Times. This post is a more technical version of Part 1, meant to quantify and expand upon some of the feedback concepts laid out previously. Additionally, the role of the water vapor feedback in planetary climate is discussed.